Transport Models - N.S.W.F.B.Bedford MK Bushfire Tanker. 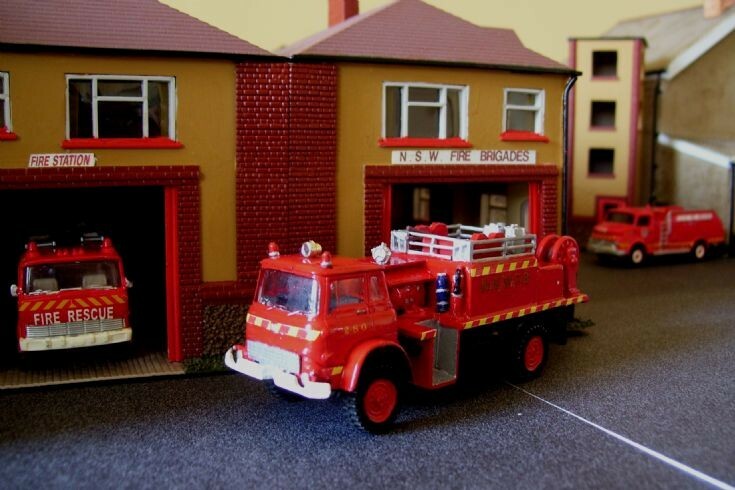 This diarama shows a model of Motor No38 from the Dubbo Fire Brigade (Station 280) of the N.S.W.Fire Brigades in New South Wales,Australia. The Bedford Tanker conversion was produced using an Airfix 1.76 scale Bedford MK.4 Tonne Truck and was a Series developed from the Bedford civilian TK 4X2 chassis to meet MOD specifications for the military used throughout the world.These type of ex-Military vehicles were widely used by fire brigades in all states in Australia throughout the 1980's and 1990's and were for many the main appliance in many cases for many volunteer bush brigades across the country. The 2 bay fire station was made from using two'Dapol'model railway kit houses joined together with the brickwork and stonework added to make this look like a typical Australian small town fire station. That looks like a Wiking Mercedes airport truck in the background. Added by Bristol Bob on 15 October 2010. Hi Bob, well spotted.The pump in the bay and the unit in the yard were both HO.00 scale models from Wiking.The Mercedes pump with a little converting was made to look like an International/Acco pump, where as the other was converted to look like the Mercedes tanker used by the N.S.W.F.B.actually until quite recently.I also converted a Mercedes TL from Wiking to look like an International/Acco appliance from the New South Wales.Pete. Added by Pete Matten on 16 October 2010. Hi Pete, you have really caught the character with these scenes and the Bedford Tanker looks very good. A little information for you. About 1981 the N.S.W.F.B. purchased 7 of these tankers, known as Heavy Tankers, with a water capacity of 845 galls (3, 800 litres). Pump midship Delta, driven by a Isuzu diesel. Output 150Gpm -(675Lpm). Nearly all stationed around Sydney's outer suburbs where reticulated water could be scarce. NSW Bush F.B. which was run by local government councils (which had 2, 400 brigades)with over 70, 000 volunteer fire fighters, ran a very large fleet of these tankers. Note: the complete lack of crew protection - just a rail to hold on to. This organisation ceased to exist some time ago (about 1995) and is now the New South Wales Rural Fire Service. With more State Government control and a much more standardised fleet and a change in fleet colour to a tangerine colour for all vehicles. Looks very nice, but that's only my opinion. Added by Graham Dickens, Australia on 17 October 2010. Hello Graham, thanks for the information regarding the NSW Bush Fire Brigades, now the NSW Rural Fire Service, really most interesting.Lets also though not forget the Metropolitan(Sydney)and rural areas covered by the State's 325 brigades of the NSW Fire Brigades with aproximately 6, 000 permanent and volunteer personnel.The N.S.W.Fire Brigade covers an area as large as what was the old West Germany, Austria, Switzerland and Holland combined, the area covered beleaved to be the largest in the world under the control of a single fire control authority. I spent around 3 years researching the fire services in Australia and New Zealand many years ago with the hope of publishing a book.No one at that time had ever published anything covering all the States in Australia, including Tasmania and the New Zealand Fire Service combined in a book(only pictures of fire engines), but never with the history of the countries and the fire services.I wrote to the various brigades over a period of time for info, historical data, photo's, etc, and also had friends(pen-pals)across the various states in Australia, and in New Zealand who supplied info and pictures but even though in the end I'd finished my research and typed out the finished manuscript, no one over here in the UK was at all interested in publishing the work and so its never been published and its now collecting dust along with around 1, 000 pictures. Maybe one day this manusript will see the light of day again and the historical account on the Australian and New Zealand Fire Services will be finally published.I still continue to hope.Pete. Added by Pete Matten on 17 October 2010.